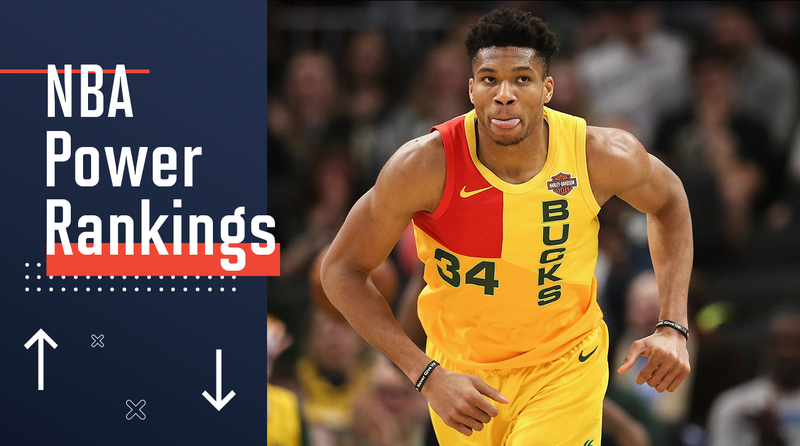 NBA Power Rankings: Can Giannis and the Bucks Keep Magnificent Season Rolling? Can Giannis Antetokounmpo and the Bucks fulfill expectations that come with a top seed in a LeBron James-less Eastern conference? 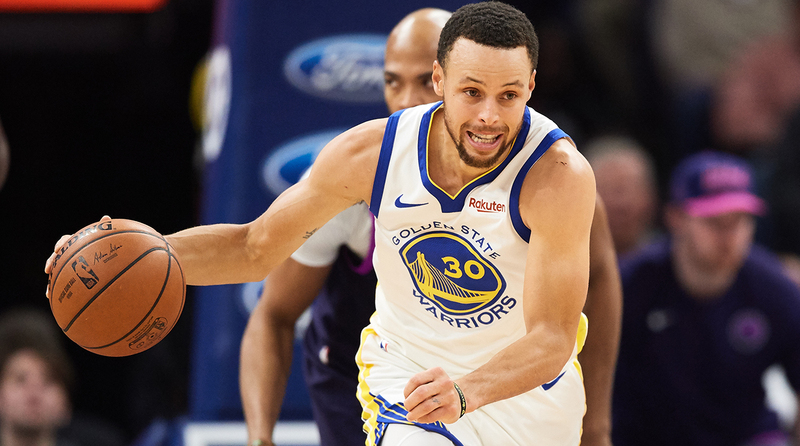 With the NBA season winding down, Sports Illustrated takes a look at what each team should look forward to in the latest edition of power rankings. Has March Madness been exciting enough for you? I mean, who doesn’t love watching three future-lottery picks get pushed to the brink of elimination by a 7’6” titan named Tacko? Well, now is a time to take a break from too many bad charge calls and coaches yelling at players in a way that forces a national conversation. But let’s keep up the basketball mania by focusing on the guys who actually get paid their share of the billion-dollar television deals. For this week’s Power Rankings, we’re going to discuss what about every team should excite you most as the season winds down. Whether it’s getting to turn to the playoffs or the potential for a big offseason, each team has something to look forward to that has been determined by these first 70-plus games of the season. The Knicks are liable to play a close game here-or-there that will be interesting and give you hope that maybe this team will go somewhere with a top pick and one or two big free agents. But after three thrumpings and then having Kevin Knox and Frank Ntilikina get injured to close the week, now is officially the time to just pack it in and hope you can watch Duke, Texas Tech and North Carolina play right up until the end of the regular season with the Knicks. At least one player from one of those teams will likely be in New York next season, so just be hype about potential future Knicks like you have been for the last few years. Last year it was Josh Jackson who closed out the season on a high note, now it could be Mikal Bridges’s turn. He’s scored in double figures in each of the last four games, which is his longest run of the year. The final eight games of the year might not seem like a lot when a team is already out of it, but that is 10% of the season. That’s still plenty of valuable time for a rookie on a young team to get some quality NBA minutes and boost his confidence for next season. Look, we’ve all spent a lot of time making jokes at the Lakers’ expense this season. A large majority of them were hilarious. But assuming they do get another All-Star to pair with LeBron James, they will likely be coming back with a vengeance. And all those fans you spent all season trolling will be in your mentions asking why you aren’t keeping the same energy that you had right now. This season was as much about figuring things out as it was about making a good playoff run. Yes, missing the playoffs entirely is a bit embarrassing and raises some bigger concerns about the front office and or the coaching staff depending on who you let tell it. But at the point you aren’t competing for a title and you’re the LeBron James led Los Angeles Lakers, is missing the playoffs anything more than a nitpicking arguing point for future GOAT debates about players and franchises? We see now that the “surround LeBron with playmakers” approach probably isn’t it. We also know what the young core can provide and how they will play with James. It’s a shame only Kyle Kuzma gets to take advantage of these last few games. And now they get to use this knowledge to regroup during the summer so 2019-20 is about chasing a banner and not about trying to convince Kobe stans to be Laker fans. Barring this team landing Anthony Davis and Kevin Durant, there is no way next season will have as much hype as this one. Which is probably a good thing. Adding a bunch of three-and-D guys who more casual fans don’t know might not attract the eyeballs Lance and JaVale and Rondo and Beasley did, but it could be better for the overall team construction. There’s now a better understanding of what they need to survive when LeBron goes down and the unnerving fear that maybe LeBron isn’t as much of a cyborg as we thought and he could miss significant time for injury. If all of this doesn’t push them to make best use of all this roster flexibility to create a championship contender by mid-July, nothing will. But that’s the glory in being the LeBron James led Los Angeles Lakers. You’re either competing for a championship or the whole season is about Bron Bron kicking it in LA making TV shows and movies while the franchise functions like a soap opera around him. Either way, everybody who doesn’t root for the Lakers is going to be entertained and rooting for Lonzo to get his money back from that scammer. The Pelicans had expectations that were probably a smidge too high entering the season, but it still hurts to see the season end like this. But as the franchise gets set to turn the page and start a new chapter that is certain to create more questions than answers about the future during next season, it can take solace in knowing it took the Lakers and Celtics down with it. Los Angeles has had a worse record than New Orleans since the trade deadline passed and Anthony Davis remained a Pelican. And the Celtics have been marred by speculative trade packages and players not clicking together. And now Al Horford is hurt. So as you enjoy the final seven games Anthony Davis is on the roster, know that you helped ruin the seasons of the two most historic franchises in the league simply by not trading away your generational talent. So enjoy seeing their fans get mad online through the offseason as you watch the team start a rebuild. Since January, Collin Sexton is third among rookies with 17.7 points per game and his 43.4% three-point percentage on 4.7 attempts per game is second among rookies getting consistent minutes. There is still much to be desired when it comes to his passing as he’s only averaged 3 assists since the New Year, but the scoring makes you believe that at the very least Cleveland has gotten a guard who can go get a bucket and help stretch the floor. Maybe he can extend this career-long eight-game stretch of scoring 20-plus all the way until the end of the season. Part of the reason the Luka vs. Trae debate has picked up as of recent is because the Mavericks have been much worse than they were at the start of the season. And while Doncic hasn’t been leaps and bounds better than Young like he was at the start of the season when he ran away with the award, he is still playing great ball. But unless Dallas has a few more performances like Saturday in Oracle, the internet will keep forcing the debate on us. So enjoy these last few games, and then wait to enjoy Luka officially getting the award so you can bask in that feeling of being right all along. Without Zach LaVine the Bulls earned the second of consecutive victories, knocking off Bobby Portis and the Wizards in overtime. Despite having the second worst offense in the league for the season, the Bulls have had the 12th-best offense since February along with a 9-13 record. They are still going to have good odds for a top-five pick, but they’ll likely also grab a few more W’s along the way. There are a lot of players on Washington that are worth monitoring for the season’s final eight games. From Bradley Beal, who’s been straight nuclear all season; to Jabari Parker, who was playing the most efficient ball of his career prior these last two games; to Tomas Satoransky, who has taken on the role of being Beal’s backcourt mate with John Wall out, there are plenty of players who make next season’s prospect in Washington slightly more promising than you would think based off the team’s current record. But ever since Kelly Olynyk knocked down the towers in Game 7 in Boston in 2017, one game away from the Eastern conference finals, the general energy around this team appears to have been going downhill from a distance. Last year, missing the playoffs would have been a much bigger failure than their lackluster first-round exit was, so the Wizards basically had to go be tribute for the Raptors. But this season, well, it’s not that they should be breaking huddles going “one, two, three Cancun,” but they should be happy about an extended offseason to just stop and regroup befor a full season without their supermax point guard. Mike Conley is going to keep posting big numbers for the Grizzlies until they tear that Memphis jersey off his body. In the eight games he’s played this month, the Grizzlies are 5-3 and he’s produced at a high level for the most part. There was the 30-point win where he only scored 12, and then a 40-point night, a 28-and-11 game, a 26-and-eight game, a 20-and-seven game, a 28-and-12 game, a 35-and-eight game and a 23-point game. These last two seasons were not what people in Memphis were expecting, and after Conley’s injury last season torpedoed the entire campaign, it is nice to see him get a few more games with the franchise he will forever be associated with. After being in trade rumors all season, it seems likely Memphis tries once again to trade the point guard either in the offseason or by the deadline. This could be very well be his final run in Memphis and he’s been making it count. Since winning four of five to start the month, Memphis has lost four of its last five and has been resting Conley on back-to-backs. He’s probably going to be held out of two of the final nine games, but as long as he ends the season with a bang April 10 against the Warriors, it will make the last 12 years all worth it. Jaren Jackson Jr. will not be on the court to help make this more entertaining while flashing some hope for the future, so instead Grizzlies fans can just mostly live in the past for these final games and watch Conley use both hands at the rim, drop dimes, hit big threes and drop in runners whenever he feels like. Remember why he was given the biggest contract in league history at the time he signed it before he spends the last two years of that deal somewhere new. All that’s left for Minnesota right now is Karl-Anthony Towns making third team All-NBA and earning a supermax extension. There’s still some time for Josh Okogie to give a glimpse of his potential during these final nine games, but KAT closing out his season like a monster is a much more enticing topic to think about. Since the car crash that forced him to miss the first three games of his career, he’s been averaging 31.4 points, 14.7 boards, 1.2 blocks and he’s shooting 56.4% overall and 50% from three on nearly six triples a night. What more could you want? In both ends of a back-to-back against the Celtics and Raptors the Hornets saw their season hanging on by a thread in the fourth quarter. Against the Celtics they rallied back from down 18 with a game-ending 30-5 run. Down two with less than five seconds remaining in Toronto, they got this. And you thought Duke was the luckiest team from North Carolina on Sunday. Trae Young’s touch isn’t limited to outside the arc. As Bryan Kalbrosky of Hoops Hype noted last week, Young’s floater has been a key part to his success this season and it will continue to be a major factor going forward. Particularly when defenders can’t tell if he’s shooting or putting up a lob for John Collins diving after a screen. This was an instance he was shooting. With this current losing streak that included blowing an 18-point fourth-quarter lead and finally dropping one to the 76ers after dominating the series, it’s about as bleak as it’s been in Boston all season. But come July, a lot of things will be sorted out on their own. And then you can go back to spending the summer watching YouTube clips of Jayson Tatum practicing with a future Hall of Famer. Tatum missed the biggest shot of the game and finished 5-16 FG with 0 FTA. Thanks again for the tutoring, Kobe. The Kings will be the last Western conference team eliminated from playoff contention and here’s hoping they hold off on being eliminated for every possible second they can. There is no prize for waiting until the last week of the season compared to the second-to-last week of the season to get eliminated, but the later it goes until officially getting a mark placed next to its name in the standings does likely mean this team will be in a better position to finish above .500. This season has been a wild ride in Sacramento, and even after Sunday’s loss in Los Angeles it still feels like a successful run that could have lasting effects on the franchise. This is a bit obvious considering what has happened the last 12 seasons there, but it bears repeating when the team ends the season by slipping out of the playoff picture. It may not feel like it because of the slow fall out of postseason contention, but the Kings still have a lot to play for. Mainly in that they can be above .500 for the first time since their last playoff appearance in 2006. Similar to last year’s Nuggets who weren’t eliminated until Game 82, this year’s Kings have looked like the team that is going to impress most next season when all the young guys take another step and hopefully Marvin Bagley III stays a bit healthier. The pieces are all there for this team to turn itself into a consistent playoff contender and for right now, they can still technically play for ending that postseason drought this season. But blowing a 28-point lead to the Nets and losing in Los Angeles almost assured Sacramento it will end its season April 10 in Portland. However, if that game is for win No. 42 or maybe even No. 43, it will take away some of the sour taste that sits in people’s mouths because of the 6-11 stretch that came after moving to a season-best record of 30-26. Even when Victor Oladipo was healthy a lot of national media was dismissing the Pacers’ playoff chances. So for the second straight postseason, Indiana is going in with most people hoping they get bounced in the first round just because they barely watched them play in the first place. But with a two-game edge on Boston and two games against the Celtics to close the season, the Pacers have a great shot to keep homecourt for the first round. And ending a four-game skid that started with a loss in Denver by waxing Denver is a good way get on the right track for these last few weeks. Earlier in the season Detroit was seven games below .500 and sitting outside of the playoffs. Then it went on a tear and moved up to sixth in the East, but has since slid back down to seventh. Considering how the Pistons have performed against the Raptors this season, that might not be the worst matchup. But whoever it is they face, they want to go in playing better basketball than this current 3-5 stretch. Nikola Vucevic was Orlando’s first All-Star since 2012. The team is on the verge of making the playoffs for the first time since then as well, but it still has a game to make up on Miami. Guess who Orlando plays on the second night of a back-to-back Tuesday? In the public eye, this team is far removed from the Dwight Howard era. But at the point there has been no success to speak of since he left, it feels like that separation marked the beginning of a spiral for both parties. While Howard spends the rest of the season on the shelf, maybe the Magic can finally move past their demons with their newest All-Star big man and get back to the playoffs. This team has plenty of young talent and the likelihood of gaining playoff experience this season. And after they sign D’Angelo Russell to a max contract, they’ll have the key pieces all on board for next season. 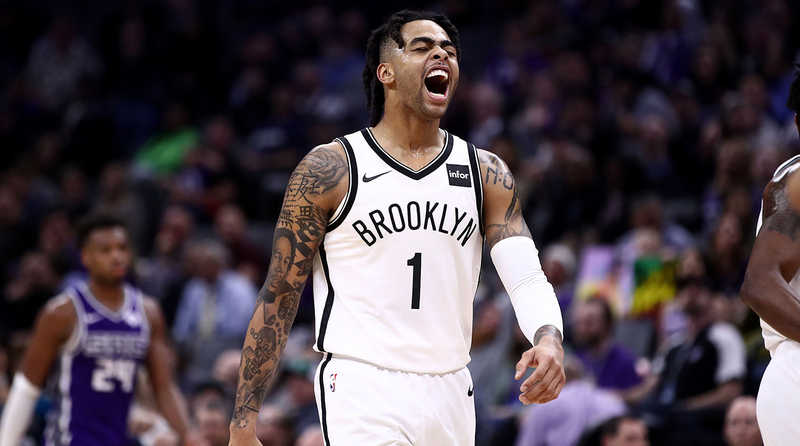 With D-Lo posting his career high in a 28-point comeback and then leading the charge on the night they eliminated his former squad, that max deal is more than deserved at this point. But you know what’s better than having talented players already on the team? First-round draft picks. Something the Nets actually have going forward. They’re free from constant put downs in relation to Boston’s assets at exactly the right time. While his free-throw shooting hasn’t improved as much as people would like, the rest of Russell Westbrook’s game has continued to get better throughout the season as he got his legs under him. We tend to forget and or downplay the impact things like knee surgeries and missing the preseason can have on a player. So as the team slides down the standings, it can at least have hope that Westbrook will look more like an MVP during the postseason and less like a dude who had a 38.6%-26%-60.6% shooting split (field-goal percentage—three-point percentage—free-throw percentage) in December. The postseason crunch led to Miami playing some of its best basketball this season, going 10-4 dating back to Dwyane Wade’s game-winner against the Warriors. And it’s also been a time for the Heat and their fans to fully embrace the emotions of Flash calling it a career. Nobody wants to see Dwyane Wade, the man who delivered one of the most breathtaking Finals performances of the last 25 years, play his last game in Brooklyn on the second-night of a back-to-back. But if that’s how the basketball gods determine that Hall of Fame career needs to end, at least we know he’s going down giving it his all. This season isn’t going to end with a parade, and for a fan base that’s watched the greatest player in franchise history win three titles, reaching the playoffs as the eight seed will only mean but so much. But knowing Wade helped guide the team on one last run will bring back all the feels from his 15 seasons there. If Pop is having fun, we should all be having fun. And considering the Spurs have won 10 of their last 12, I’m fairly confident the players enjoying themselves as well. When you throw everything together on the fly during the season, it makes it a little hard to figure out the best way to make everything fit. But if Wednesday night against the Celtics was a sign of what’s to come for the 76ers, then teams should be concerned. Playing through Joel Embiid for three-plus quarters and then turning to Jimmy Butler to close is going to be a key schematic approach that needs to be replicated if Philadelphia is going to make a deep run. The team could still benefit from a bit more of Ben Simmons pushing the pace and needs to get Tobias Harris shooting better from three, but getting Embiid and Buckets comfortable is most important. If these two can coexist, especially under this dynamic where Embiid bulldozes opponents for the first 36 minutes and then Butler snipes away at their dreams of coming back that survived the initial pummeling from the big man, don’t be shocked if they come out the East. But they can’t let any more easy ones get away during the final stretch like they did in Atlanta Saturday. Were you seriously expecting this to be about anything or anybody else? After what he did in Oklahoma City? Next season, Siakam is going to be an All-Star and officially make the leap into being one of the most liked and rooted for players in the league. Hopefully he accelerates that process by showing out in the playoffs. Which he probably will do, because when has Pascal Siakam disappointed this season? With two games against Denver still on tap and six of the other eight games coming against teams below .500, the Trail Blazers could still make a run for the two-seed. But even just moving up to the three and creating the possibility of facing Denver or the seven seed in the second round would be a big bonus. But after what happened last season as the three seed, let’s not make the only concern here the postseason. Instead, we should enjoy watching Damian Lillard do what he does best and deliver in the final moments of games in a way only he can. If Portland is going to make a deep run in the playoffs, Dame will likely need to go off. And with CJ McCollum still dealing with a knee injury, even more falls on Lillard’s shoulders than previously expected for the time being. Jusuf Nurkic has been a constant in the middle and the addition of Enes Kanter has meant the bench got an additional jolt of scoring it could really use. But this will all fall on Lillard, even when CJ gets back. So for every moment Dame Dolla cashes in in the clutch, celebrate and enjoy as if it will never happen again. Every season can’t end as positively as those involved would hope, and after experiencing that first hand, the Blazers can only hope to be loose enough this April that they enjoy the moment even if it ends in another early exit. But whatever successes do come from this season, they will likely involve No. 0 hitting an absurd shot like this to make them happen. The more this team can keep running through the weaker opponents on its schedule early the better. Between perfecting execution and chemistry and sneaking in some rest for the playoffs, the Jazz have every reason to enter every game from here on out as if there season is on the line even though it’s far from it. Beating up on bad teams isn’t the best way to prepare for playoff atmospheres, but there is plenty to get from some late-season beatdowns. It’s all that ever mattered. The dynasty is already in competition with the greatest ever, but a three-peat will take them to a special place. Only the 1952-54 Lakers, 1959-66 Celtics, 1991-93 and 1996-98 Bulls and 2000-02 Lakers have ever three-peated. Now’s the time for these Warriors to join the club. No matter how many more 35-point losses they suffer at home this season, we all expect them to raise the trophy. And at this point, it’s probably all anybody in the Bay cares about. Especially the folks who were responsible for filling up Oracle every night at the start of this run before Klay had to start asking fans to provide some energy. There’s a lot of ways this Nuggets season could end and none of them would be but so surprising. Depending on who you ask, a championship run and a first round exit are just as likely to happen. 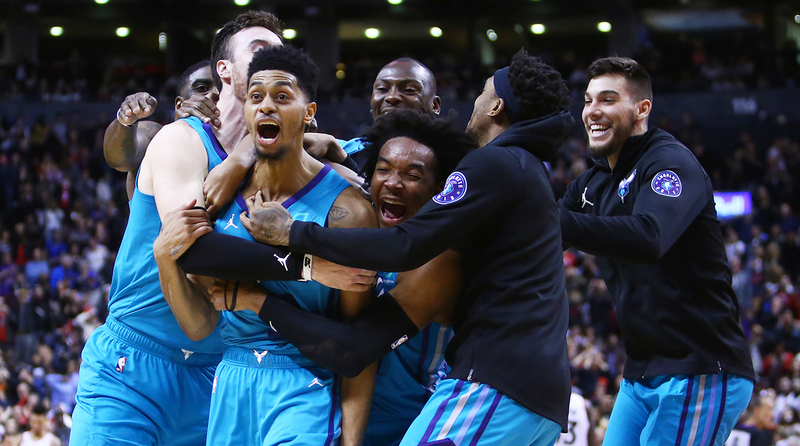 But with this being the squad’s first time in the playoffs with its current roster, all that matters is that the players get more than 86 games. Getting swept like last year’s Trail Blazers would be a big blow to handle. But literally anything else and Denver can walk away knowing this was a great season, even if it didn’t go far into the playoffs. It’s the Nuggets first time there for the most part, and while simply getting there shouldn’t be enough, you have to start somewhere. And a top-two seed in the West means you had a great journey for the year no matter the final destination. There’s no telling what the future holds for the Clippers. They could sign a big name free agent and then land Anthony Davis in a trade. They could come right back with a group similar to this and bank on the growth of Shai Gilgeous-Alexander, Landry Shamet and Ivica Zubac. But for now, just revel in the fact that the team has won 10 of its last 11 and is headed to the playoffs for the seventh time in the last eight seasons, which is the best stretch in franchise history. All the while the Lakers will miss the postseason for the sixth straight season, which is the worst stretch in franchise history. And in case you didn’t hear about this already, here’s a great story about Lou Williams being a dope human being. This season has been mostly about the world marveling at the jaw-dropping, spellbinding athletic feats Giannis Antetokounmpo has provided on a nightly basis. However, it could just as easily be about coach Mike Budenholzer playing a major role in this team’s accession up the East standings to the top spot all the way from seventh last season. With the injuries to Malcolm Brogdon and Nikola Mirotic, Budenholzer will be needed now more than ever to get the most out of the roster like he already has throughout the season by putting an emphasis on three-point shooting and creating space for Giannis to live in the paint. On Tuesday, we get to see Giannis and Harden face off for the second time in a battle of MVP candidates and a potential Finals preview. But after that night, the pressure turns back to coach Bud and whether or not he can have this team ready for the playoffs despite two major rotational players spending the last few weeks of the regular season banged up. And when we do get to the playoffs, it will be on Budenholzer to make the key adjustments from series-to-series if this team will fulfill the expectations that come with a top seed in a LeBron James-less Eastern conference. He’s done his part so far this season and will likely end up in the top three on the Coach of the Year ballot because of it. If he delivers again in April and May, it will be a sign of great things to come in Milwaukee with him and Giannis at the center of it all. And after what he’s done so far, there’s no reason not to think Budenholzer will do his part in keeping this magnificent season rolling. The Mike D’Antoni era in Houston has been all about the Rockets throwing up gaudy numbers from the three-point line that will only be topped by later versions of the Rockets. This season has been all about James Harden being the best scorer since 86-87 Jordan. No matter what happens in the playoffs, this is a period of franchise history you will want to take the time to remember and enjoy as a fan. Ask the people in Phoenix. Only one team can win a title every season, and there’s more to the game than just championships to enjoy. Sometimes a back-to-back MVP is the most you can get. And isn’t that already a lot to get?